Go back to 1989 to see what was available at Foot Locker during March Madness. 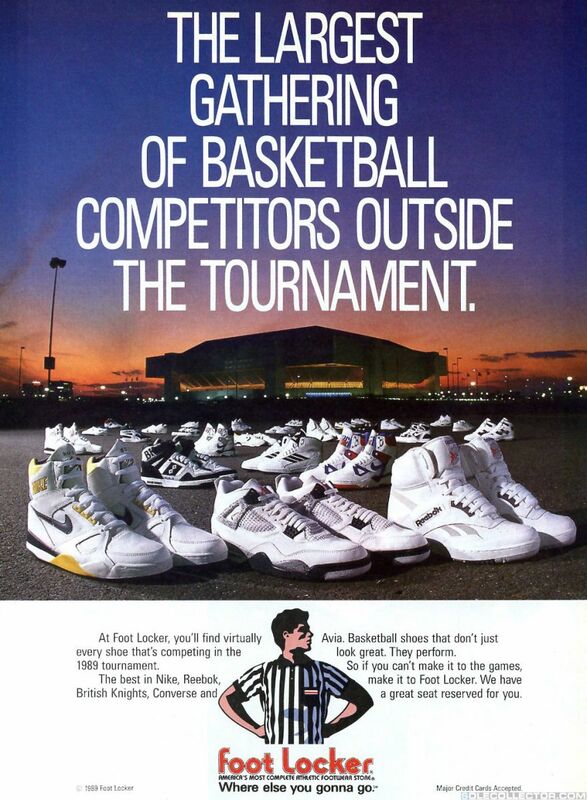 It is down to the Final Four in the men's NCAA basketball tournament, so before this year's tournament ends and a new champion is crowned, we wanted to take a look at this March Madness-related ad from Foot Locker from way back in 1989. This ad gives you an idea of what you would see when you walked into a Foot Locker in 1989, and it was obviously a great sight: The Air Jordan IV, Nike Air Solo Flight, Air Force III, Converse, adidas, Reebok, Avia and even everybody's favorite late-80's brand, British Knights. The Air Solo Flight pictured in the front left looks like it would be appropriate for the 1989 champion Michigan Wolverines, who are in good position this year to win their first NCAA title since Glen Rice and Rumeal Robinson led them in '89. Who is your prediction for this year's tournament champion? Would you rather have 1989's basketball footwear selection, or does 2013's modern collection of basketbal kicks win?